“Please see me in my office when you get a break.” A message that is not for the faint of heart. It is also a message I received often from my principal when I was teaching. You read that correctly, I was regularly asked to visit the principal’s office. Given my fear of being in trouble, this is not a message I would typically welcome from my boss but she was not a typical lady! Our entire staff received short and direct messages like these and if you can believe it, the strongest feeling it brought up for us was curiosity. 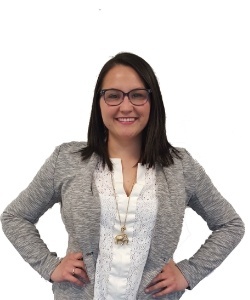 Her emails could mean anything from selecting you for a new leadership opportunity, feedback on a lesson she popped in on, or simply a change in your duty assignment. We generally felt confident that Debra believed in us AND held us to high expectations so whatever she wanted to talk about was probably an opportunity to learn and grow. Known in our school district for a positive school culture, her no-nonsense demeanor, and high student achievement, Debra is a leader I admire. She was very confidently herself while also creating an environment of exploration for the rest of us. These are some traits I look back on often as I navigate my role in supporting school and district leaders. What makes a leader effective? How can they create a culture that sparks innovation? Click to download a high-res PDF. 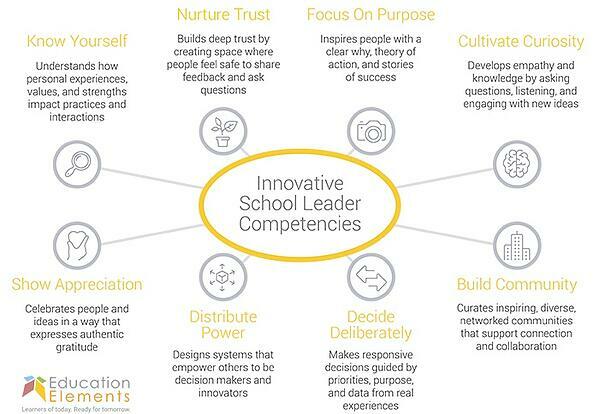 In this post, we will explore the first two competencies of an Innovative School Leader which serve as the bedrock on which the other traits flourish: Know Yourself and Nurture Trust. If you know me, you know I love personality quizzes. I’ve taken many of them: Meyer-Briggs, Keirsey Temperament Test, Strengths Finder, DOPE Bird Personality Type or our own Org Leadership Style Quiz. These feed into my perpetual quest of deep self-understanding. I find it fascinating to discover a tendency I have and analyze the different reasons why it may be so. Was it something I learned from my parents? A habit I picked up in school? A result of my community? Grounding ourselves in our identities, in whatever way that identity is defined, is also a common first recommendation in most leadership books and frameworks. Consider Elena Aguilar’s take on socio-political identity. In her new book, Onward, Aguilar talks about knowing ourselves as a first step to building emotional resilience. How we perceive the world helps us determine how we react to it. Self-knowledge can serve as a source of strength allowing us to manage stress through the ups and downs of life and learning. Knowing who we are socio-politically means understanding your core values and how your background and cultural context has shaped them. Knowledge of self is powerful because it can lead to a genuine respect and appreciation of other people’s values. Additionally, knowing what you stand for can help you identify when and why the behaviors, action or beliefs of others’ clash with your own. This is not easy work as it encourages us to dig deep within ourselves, a process that can bring up pain while uncovering inner strength. We believe “knowing yourself” is the key ingredient to our next competency because once we know ourselves we are empowered to create a place where others can do the same. Being able to bring your whole self to work is critical; It is also often a luxury because it is risky. Creating a space where individuals can explore their identities inevitably leads to a place where difficult questions and conversations emerge. Brené Brown, known for her research on vulnerability, talks about the components of “Rising Strong” in her book by the same name. She breaks down the process into the Reckoning, Rumble and Revolution. Consider an anecdote Brown shares in her book and this blog post: Courage Over Comfort where Andrew, an organizational leader, experiences failure. Upon reflection, he realizes the points in which he decided to move forward despite his better judgment. Once he made this realization and pushed through his “rumble” he was able to reckon with his mistake and have a frank conversation with his team. As a result, his team learned from their struggle and emerged as a more solid unit because they were confident in Andrew’s leadership. There is a lot to learn from Andrew’s story about building trust. In sharing of himself with his team he took an important step towards building psychological safety as defined by Amy Edmondson as “a belief that one will not be punished or humiliated for speaking up with ideas, questions, concerns or mistakes.” This is a tall order because it means that you have to have more positive than negatives experiences with a person or within a team in order to build trust. Edmondson encourages taking the following steps to develop and nurture trust: (1) Frame work as a learning problem (2) Acknowledge your own fallibility (3) Model curiosity. Trusting environments lead to strong teams and strong teams lead to innovation. Google outlines how psychological safety is the most significant of five key ways to build a successful team. Imagine what we can do if we intentionally build school cultures that nurture trust: trust to explore, experiment, fail, and learn. Consider the ripple effects this could have on teaching, learning, and problem-solving. When we commit to the challenging work of trust building we spark possibility and innovation! What do my core values tell me about how I approach my work? When have my core values lead me to clash with others? What might their core values be? When I have I felt psychologically safe? Would members of my team say they feel psychologically safe? Read Part 2: Involving Others to Create a Culture of Innovation and Part 3: Leading with Intention.